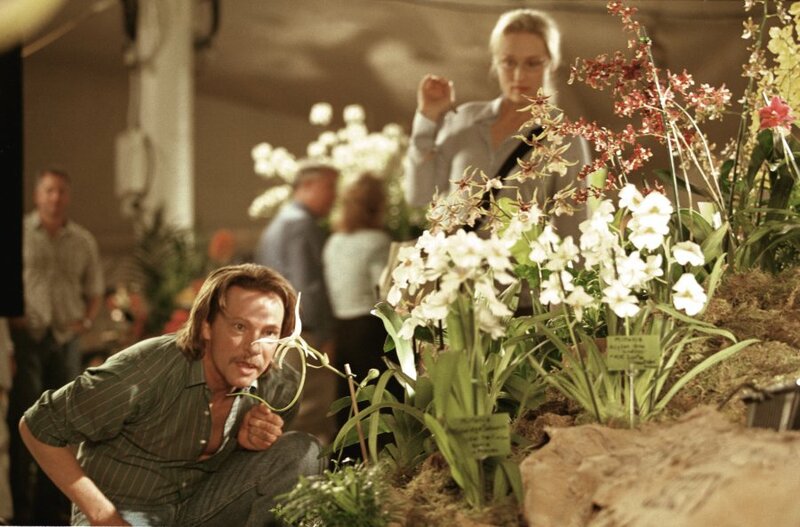 Hired to adapt a plotless, nonfiction book by real-life author Susan Orleans (Meryl Streep) about a fanatic horticulturist (Chris Cooper), neurotic screenwriter Charlie Kaufman (Nicolas Cage) struggles to craft a story out of its deeply layered, esoteric musings without relying on overused Hollywood conventions. Meanwhile, after attending a screenwriting seminar, his jocular twin brother Douglas (Cage again) plows through the writing of his first screenplay, cheerfully embracing the formulaic principles Charlie scorns. This quasi-autobiographical flick from director Spike Jonze and screenwriter Charlie Kaufman is every bit as innovative and puzzling as their wonderfully bizarre _Being John Malkovich_. Exceedingly complex, it challenges viewers by shrewdly utilizing every moviemaking cliché it lampoons, from car chases to romantic entanglements to life-altering epiphanies. Consequently, watching it takes a little work, but it’s definitely worth the effort.